When I was a teenager, the crisp cool weather of October meant my sister and I were on apple and pear duty. Our job was to pick the pears, apples, and apple-pears off the trees in the orchard before the birds or our fruit-eating dogs got to them first. We loved picking bird pecked apples off the trees and pitching them across the yard like baseballs, dogs tearing off in search for them. Every year we ended up with boxes and boxes of apples and pears. We baked them, froze them, dried them into chips and fruit leather, gave them away to the homeless shelter in town and to every friend who would take some home. 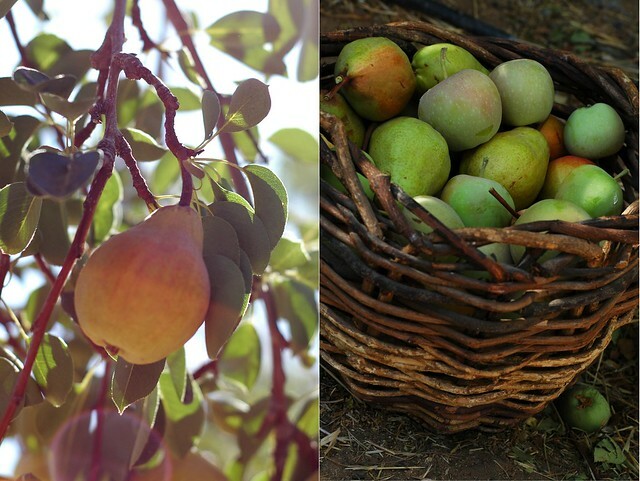 From October until December we wouldn’t eat any other fruit than apples and pears, pears and apples. I was so sick and tired of eating every style of apple and pear imaginable that by December I would vow to not eat another apple or pear again! Three seasons would pass without an apple or pear in sight. As those chilly October winds blew in, it would bring with it a sudden craving for a sweet pear or cup of warm fresh applesauce. I don’t live near an apple or pear orchard any longer, but the craving for an apple or pear still hits me like a ton of bricks every October. This week, apples and pears of every shape, size and color were in abundance at the market and I picked up a few pears with something warm and comforting in mind. This recipe is one of my own. Inspired by Martha Stewart’s Quince Slab Pie featured in this November’s issue of Martha Stewart Living. 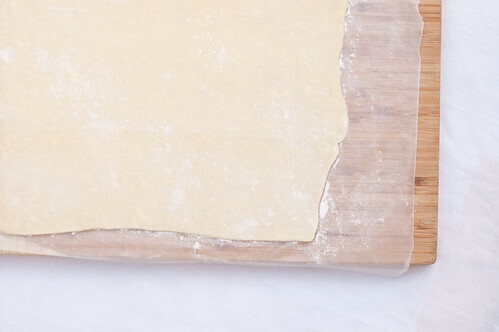 Roll out puff pastry to a 12 by 15 inch rectangle on floured parchment paper and cutting board (I am using floured wax paper for this step). Place everything into the freezer until firm, about 20 minutes. 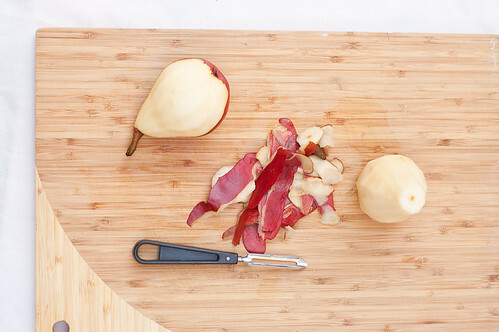 Peel pears and slice into thin slices about 1/8th of an inch wide. In a medium bowl combine sugar, honey, lemon juice, spices, salt and flour. Gently mix in pears to coat. Set aside. 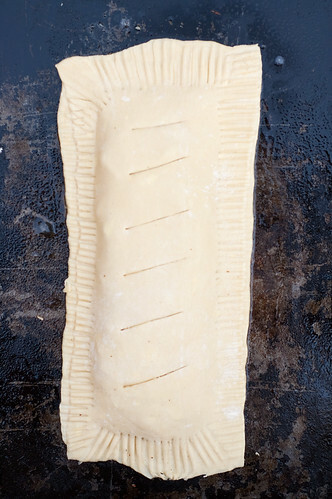 Take puff pastry out of the freezer and cut in half lengthwise to make two equal sized rectangles. 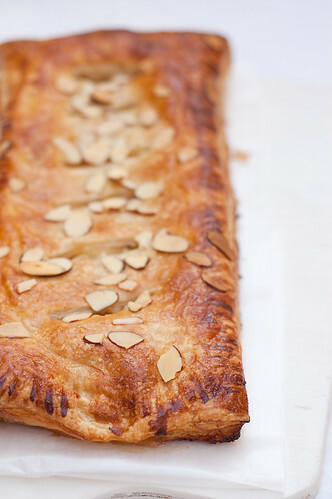 Transfer parchment paper and one half of the puff pastry to a baking sheet. If you are not using parchment paper then grease your cookie sheet. I ran out of parchment so that is what I did. 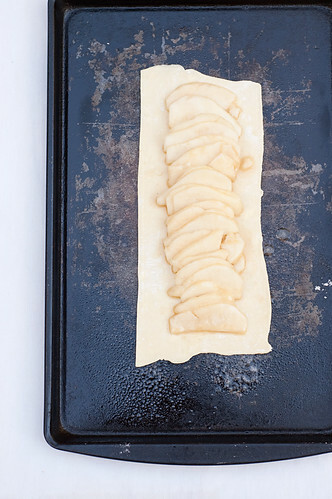 Carefully lay pears in a neat row down the center of the puff pastry leaving room around the edges. Sprinkle with slivered almonds. Toss out any leftover juices. 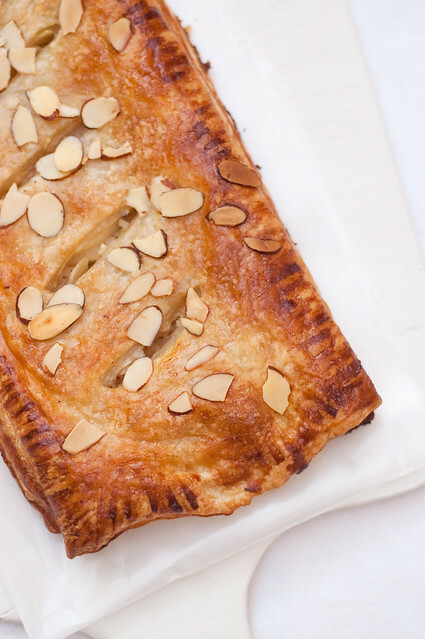 Wash edges with egg wash and place top puff pastry sheet on pears. Crimp the edges with a fork. Put the pie back into the freezer to firm up. About 15 minutes. Meanwhile preheat your oven to 400F. Cut 6 two-inch cuts along the top of the pie for steam to escape. 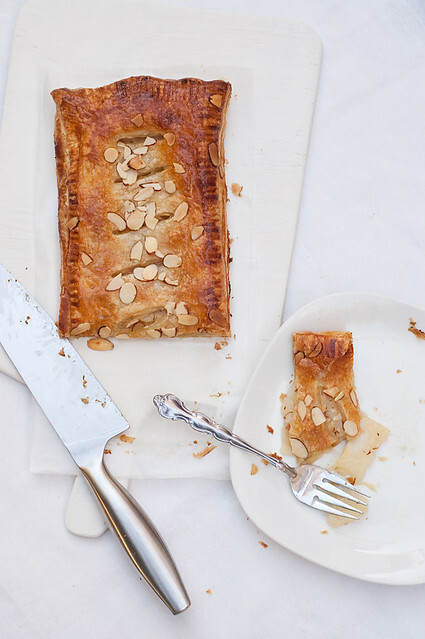 Coat the top with egg wash and sprinkle with almonds and sugar. Bake for about 25-30 minutes until entire pie is puffed up and golden brown. Let your pie cool for 10-15 minutes and enjoy! * I cannot guarantee that you will have the same results as I do. Humidity, elevation and outside temperature all affect the way a recipe turns out. If you have any questions or find an error please leave me a comment and I will try to help out! * This is the first week I am joining in for Fall Fest 2010. How does it work? This is a collaborative effort to share wonderful recipes and tips. To join in simply leave a link to your pear related recipe or tip on this post and on the other Fall Fest Blogs which you can find here and below. I’m thinking on having a fall tea picnic in the park this weekend, and this is the perfect treat to make, bring and serve outside. thanks! This would be awesome with blanched almonds cut into sticks and mixed into the pears (i.e. not just slivered ones on top).